“As he approached Jerusalem and saw the city, he wept over it and said, ‘If you, even you, had only known of this day what would bring you peace – but now it is hidden from your eyes.’” (Luke 19:41-42 – NIV). A violent doom awaited that people. Jesus penetrated and voiced its cause – they didn’t “know” the “time” (Luke 11:44) nor the prophetic reality exploding in their midst. Tradition and erroneous views of the Torah led to national deception. Paul also struggled with specious teachings in the early Christian churches. Of special note were those in Thessalonica. He had told them that Christ would return and would come suddenly when that era arrived. They misunderstood that message. It appears as though they assumed that it was so imminent it bruised many hopes. Confusion about the future loomed with those new believers. Paul chose to address this concern by giving an eschatological sign – the rise and work of the antichrist must be anticipated first. Then the Messiah would return. Note how he began: “Don’t let anyone deceive you in any way” (II Thessalonians 2:3 – NIV). Beware of defective teaching. Truth was available! Don’t be fooled. They must have a “knowledge base” to recognize error. Jesus, in His apocalyptic Olivet discourse, began the same way: “Watch out that no one deceives you.” (Matthew 24:4 – NIV). The Apostle continues: “That day shall not come, except there come a falling away first, and that man of sin be revealed, the son of perdition; Who opposeth and exalteth himself above all that is called God, or that is worshipped; so that he as God sitteth in the temple of God, showing himself that he is God” (II Thessalonians 2:3-4). 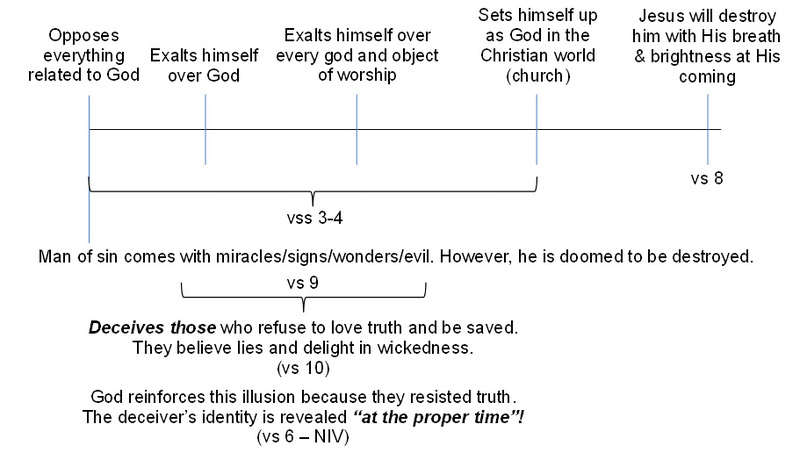 That day, the “Day of Christ” (vs 2) is equivalent to “Christ’s final coming” or parousia (G). Paul had written to them about the necessity of being prepared for this event (I Thessalonians 4:14-17, 5:1-11). The whole issue of the Second Advent needed review. Paul now focuses on that apostate leader – a deceiver – who will be unmasked before that Messianic event. It would be a signal that the end was near. It is imperative that Christians now know, have a precise knowledge base of, who this leader is and at what point he will appear. We have arrived at that time. This first event, the “falling away” or apostasia (G), is a religious crisis most important to discern (using Greek Old Testament – Joshua 22:22, II Chronicles 29:19, Jeremiah 2:19 and New Testament Acts 21:21, I Timothy 4:1, Hebrews 3:12). “Falling away” assumes that it was previously within God’s will or fold. Apostasia means rebellion within God’s church. Something deceptive, out of character, occurs within the Christian community to make it fall with such force! It comes from the wine of fornication of this apostate leader (Revelation 14:8). His church shares an “abomination” with the world that is mixed with this wine (Revelation 17:4). False belief becomes globally pervasive. Since Paul’s discourse in II Thessalonians 2 is describing a crucial fulfillment of prophecy, the “who” and “when” must be found elsewhere. Jesus pointedly advised His apocalyptic students to go to Daniel for the “rest of the story” (Matthew 24:15) in the area describing that apostasy, which He called an “abomination” and said would lead to desolation. The imagery of this eschatological “man of sin” is detailed in Daniel 8:9-13, 11:30-45; cf. 9:27, 12:11). He forces a transgression that God calls an abomination on the world. That little horn is a king also: “And an host was given him against the daily [sacrifice] by reason of transgression, and it cast down the truth to the ground; and it practiced, and prospered” (Daniel 8:12). “… a king of fierce countenance, and understanding dark sentences, shall stand up. And his power shall be mighty, but not by his own power: and he shall destroy wonderfully, and shall prosper, and practice, and shall destroy the mighty and the holy people” (Daniel 8:23b-24). “And from the time that the daily sacrifice shall be taken away, and the abomination that maketh desolate set up, there shall be a thousand two hundred and ninety days” (Daniel 12:11). That “vile person” or “contemptible person” (cf. Daniel 11:21), later known as the “king of the north” (cf. 11:28) is the same individual as this “lawless person” described by Paul. The imagery also parallels that of the sea beast (Revelation 13). In Daniel 12 and Revelation 13 the peak activity of this antichrist is over a three-and-a-half-year period (Daniel 12:7, Revelation 13:5) (note EGW 19MR 282). Lawless – he is the epitome of opposition to the laws of God. He has no compunction about breaking God’s righteous directives. He is doomed to destruction (and all his followers – implied). He is so closely identified with this destiny that the term “son of perdition” is used (cf. John 17:12). He exalts and opposes everything that is called God. He presides over that religious apostasy. He will be a rival to the Messiah at the time of the end. This antichrist will “enthrone himself” in the spirit of the king of Babylon (Isaiah 14:13-14; cf. Ezekiel 28:2). He will not be some abstract power or concept, but is an eschatological person. This “cry” means that the apostasy – the “falling away” – has consummated and advanced. The cry that “Babylon is fallen” (Revelation 14:8, 18:2-5) “come out of her,” is given during those three and a half years. John tells us that the harlot is named Babylon and that she rides and controls a “nation” (Revelation 17:5). A church and a state are represented. When do we affirm and legitimize who this is? Catholicism and the Vatican City State (united as a church–state in 1929). Daniel’s life, shows respect and kindness, and is exemplary. Before Belshazzar, the king at the time of Babylon’s fall, Daniel pointedly explained the “prophecy” and called out the rebellion that was the immediate cause for Babylon’s demise (a model to follow during the three and a half years). Daniel exemplifies how to anticipate and prepare for persecution in the face of blasphemous boldness against God’s laws, clocks and authority. The timing of the end, called an “appointed time,” and its several preceding months, is a clear period in Daniel and Revelation when Babylon falls – similar to when Daniel knew, when he entered that great banquet hall that night, that the Empire would fall and deliverance of God’s people would come! final pope associated with a coalition of ten world leaders, is noted in Revelation 17. Empire, bringing the downfall of Babylon; a Deliverer rescues His loyalists (Isaiah 44–45). These areas are clearly discussed in prophecy as enlightened issues for the final generation just before that last three-and-a-half-year period! Evidence mounts that this is what Paul alluded to in the Thessalonica church. “Let no man deceive you” (II Thessalonians 2:3). For God’s witnesses – the 144,000 – the “white horse” people – these matters, issues, prophecies are open to study! Apostasy and its leaders are to be unveiled by God’s people. Israel…. That the house of Israel may go no more astray from me” (Ezekiel 14:9, 11a). Paul has already warned us: Let no man deceive you by any means (II Thessalonians 2:3). Paul warned Timothy: “But evil men and seducers shall wax worse and worse, deceiving, and being deceived” (II Timothy 3:13). It should not be misunderstood that God anticipated willful ignorance infiltrating the church. God pointedly noted that the antichrist and his accomplices will deceive at the end of time. Babylon presents herself as a “mystery” (Revelation 17:6), fully present, fully misunderstood and filled with deception. Those claiming to be God’s people are at risk. Has the Roman Catholic Church elevated deception and evil to an “art”? Yes, through "evasion," "equivocation," "casuistry," "probabilism" and "mental reservation." Anything "is lawful if the end is lawful or if the intention is good." This has created justification not only to deceive but to even take a person's life. The Code of Canon Law of the Catholic Church (Can 252, 3) states that the works of Thomas Aquinas are official dogma, especially his many volumes of Summa Theologica. In his Encyclical of August 4, 1879, Pope Leo XIII stated that Aquinas’ theology was a definitive exposition of Catholic doctrine. He remains a saint, and his writings are revered. Later, Pope Pius IX called for Vatican I in 1868. The first session was December 8, 1869. (#15) No man is free to embrace and profess any religion which he believes to be true. (#17) Eternal salvation is not even to be hoped for outside of the Catholic Church. (#18) Protestantism is condemned and heretical. (#24) The Church has the moral right to employ force against temporal powers. (#55) Separation of church and state is condemned. (#57) Civil laws must bend to divine and ecclesiastical authority. (#79) Free speech is condemned. Most intriguing, much of the geopolitical redactions of the obama administration came from Jon Favreau, Obama's Chief speechwritter until recently. He was jesuit trained at the College of the Holy Cross, graduating as valedictorian. Duplicit words infiltrated those presidential speeches. Vatican magazine and author of the sinister book on Pius XII, The Pius War: Responses to the Critics of Pius XII, which attempts a revision of history relative to that pope’s role in the holocaust. Rising geopolitical control is in view by Rome. The Trans-Pacific Partnership (TPP) was billed as giving President Obama more fast track authority to negotiate trade agreements. But Senator Jeff Sessions reported that it creates an international legal body that would have vast powers to change U.S. law outside of the control of Congress. Intriguingly, most of the United States legislators were virtually barred from studying the bill. The Republican and Democratic House leadership forced its members to vote for this (both Roman Catholic Speaker of the House John Boehner and Minority Leader Nanci Pelosi led the charge). Those that dissented were met with “mafia-like moves” stripping them of committee leadership. The Vatican notified all Catholics that they cannot dissent from the environmental teachings of Pope Francis in his just-released encyclical Laudato Si’. It must be accepted as truth – though filled with false science. Intriguingly, secular “environmentalists” with an agenda guided the Vatican in its development. Ban ki-Moon, Secretary General of the United Nations, is pushing a geopolitical agenda using “global warming” as its justification. On December 8, 2009, 166 professors, scientist and climate experts wrote a letter to ki-Moon warning him that this issue was not settled or clear. That important communique’ was ignored by Secretary Ban ki-Moon. Intriguingly, he flew to the Vatican on April 28, 2015, to co-host, with Pope Frances, a meeting on global warming and the environment. Cardinal Peter Turkson, president of the Pontifical Council for Justice and Peace, spoke: Not dealing with this planet’s degradation was “a crime against the natural world [and] is a sin.” This whole “movement” is based on falsehood. social psychologists. Virtually all such specialists in the United States belong to one party. During Obama’s two presidential campaigns he had many of these specialists advising him how to change mass thinking. The recent demonstrations at Ferguson, Baltimore and against the RFRA in Indiana, causing major legislative changes within 48 hours, were all on cue. The opinions and values of Americans are changing, now dubbed the “Great Unraveling” of America’s moral base. This control of social thinking has led to “softening” attitudes towards homosexuality, gay marriages and transgenderism. It has ambushed the traditional “Christian mores” of society. More and more citizens are accepting this anti-Biblical behavior as normal. Under the guise of “equality” there is mass pressure to conform to a nebulous Catholic philosophy called the “common good.” Stifling dissent is a growing tool to regiment the masses. Punishing resistance is already bringing isolation and denunciation. Will religious directives under the guise of “common good” be shortly seen? This is out of the Marxist playbook, as are the writings of Pope Francis since assuming that office! Free speech is to be controlled – capitalism destroyed. Control the thinking by controlling the media. Punish any resistance. This is laying the groundwork for the beasts of Revelation 13. The defiance of the White House against Congress is unprecedented in American history. The U.S. Treasury Department has rebuffed a request by the House Ways and Means Chairman, Representative Paul Ryan, to explain how Obamacare insurers were given three billion dollars without Congressional approval, as one recent example. The Federal Reserve chairwoman, Janet Yellen, resisted any effort to audit the Reserve and how it determines monetary policy. Its decisions are shrouded in deception and corruption behind closed doors. Why is all this important? An “agenda” is moving forward that has knitted world leaders together with strange financial machinations. The Institute for Works of Religion, i.e., the Vatican Bank, has been the most “secret” bank in the world. Repeated Papal announcements that it would be “cleaned of corruption” have never gone beyond “intentions.” Its ties to international banks through secret accounts and transactions are disturbing and seditious. Closely associated with this is the highly secret Bank of International Settlements (BIS). At its headquarters in Basel, Switzerland, are offices of the International Monetary Fund – and its Financial Stability Board. The IMF is headed by Catholic Christine Lagarde. The links with Rome are sinister. The IMF is hoping to soon become the world’s financial policy maker. Of the papacy – king of the north motif – it is said, “he shall have power over the treasures of gold and silver and over all the precious things of Egypt.” (Egypt in prophecy refers to the wicked world). Something coercive is happening. In a world where this news barely surfaces, an “agenda” moves forward that will soon affect every citizen. The United Nations is launching a meeting called the Sustainable Development Summit to begin management of the entire globe through environmental issues this fall. It will be launched September 25-27, 2015, at the United Nations. Pope Francis will be the keynote speaker/person to begin the summit, after he addresses the General Assembly. You “must be made” to obey – President Obama – May 2015. Made in speech to Georgetown University as part of his contempt for conservative media and especially Fox News. Island, Sheldon Whitehuss in June of 2015. Now that the Supreme Court’s 5 to 4 decision to make gay marriage a constitutional right, Mark Oppenheimer of the New York Times is calling for the tax exempt status of churches be stripped if there is resistance to such a marriage. Do you see how deception and coercion are rising? A growing number of movements and laws will soon haunt those who remain indifferent and apathetic to this rapidly changing world! Beale, G. K.; Thessalonians (IVP Academic, Downers Grove, IL), p. 198. Bruce, F. F.; Word Biblical Commentary, 1 & 2 Thessalonians (Thomas Nelson Inc., 1984), vol. 45, p. 164. Gaebelein, Frank, general editor; The Expositor’s Bible Commntary (Zondervan; Grand Rapids, MI 49530; 1981), Thomas, Robert L.; Div. II Thessalonians. Thomas, op. cit., p. 322. Bruce, op. cit., p. 167. Hendriksen, William and Simon J. Kistemaker; New Testament Commentary, Exposition of Thessalonians, the Pastorals, and Hebrews (Baker Academic; Grand Rapids, MI; 1955), p. 171. Stuart, P. D.; Codeword Barbelon, book 1 (Lux-Verbi Books, Enfield. London, United Kingdom; 2009). Aquinas, Thomas; SMT SS ! A Body Para. ½ [cf. Aquin. : SMT SS Q A Body Para. 2/2]; http://www.aloha.net/~mikesch/aquinas.htm; The Art of Evil: “The Moral Theology of the Jesuits,” chpr V, pp. 59-72. Kant, Garth; World Net Daily Exclusive, “GOP civil war: Intense crackdown on conservatives,” June 22, 2015. Barber, Matt; Barber, Matt; Townhall.com, “You Must be Made to Obey,” May 17, 2015. Klein, Philip; worldnetdaily.com, “Treasury Won’t Explain Decision to Make $3 Billion Obamacare Payments,” February 26, 2015. Jasper, William F.; New American, “New IMF,” May 18, 2015. Bloomberg News, “Federal Crises – Liquidity Function Reviewed for Potential use by IMF,” April 19, 2015. Fowler, Franklin S., Jr.; The Coming Battle between Two Apostate Powers – Again! (Daniel 11:36-45), p. 20. Barber, Matt; World Net Daily, May 17, 2015. Hemingway, Mark: “Use Rico Laws to Prosecute Global Warming Skeptics,” The Blog; June 2, 2015.